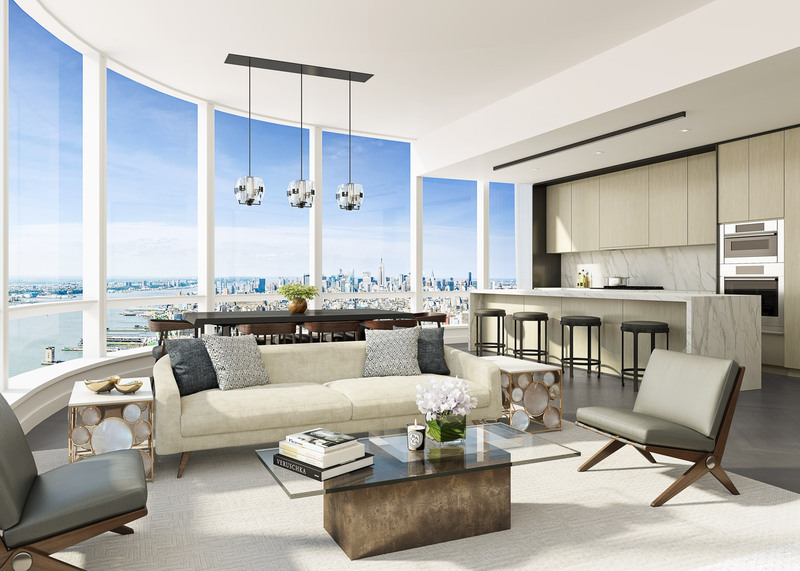 Renderings of a sculptural Manhattan residential skyscraper by Kohn Pedersen Fox have been unveiled to entice buyers to purchase units costing up to $18.5 million (+ slideshow). 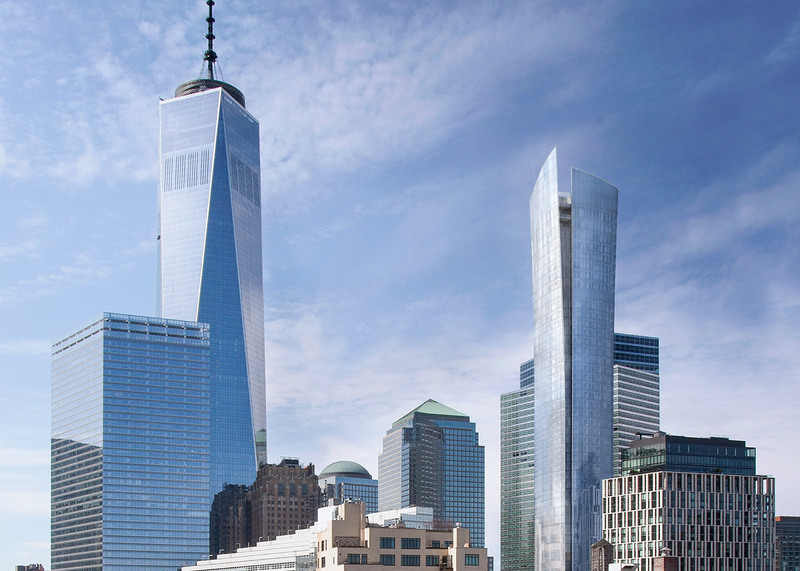 Called 111 Murray Street, the 58-storey condominium tower is currently under construction in the Tribeca neighbourhood. The 157 units range from studios to a five-bedroom apartment, with prices starting at $1.5 million and climbing to $18.5 million (£1 million to £12.9 million). Reaching a height of 800 feet (245 metres), the skyscraper is a notable addition to Tribeca, where 56 Leonard, a Jenga-like, 57-storey tower by Herzog & de Meuron, is nearing completion. Sheathed in glass, 111 Murray Street features a curvaceous form, twisting as it rises high above the surrounding buildings. 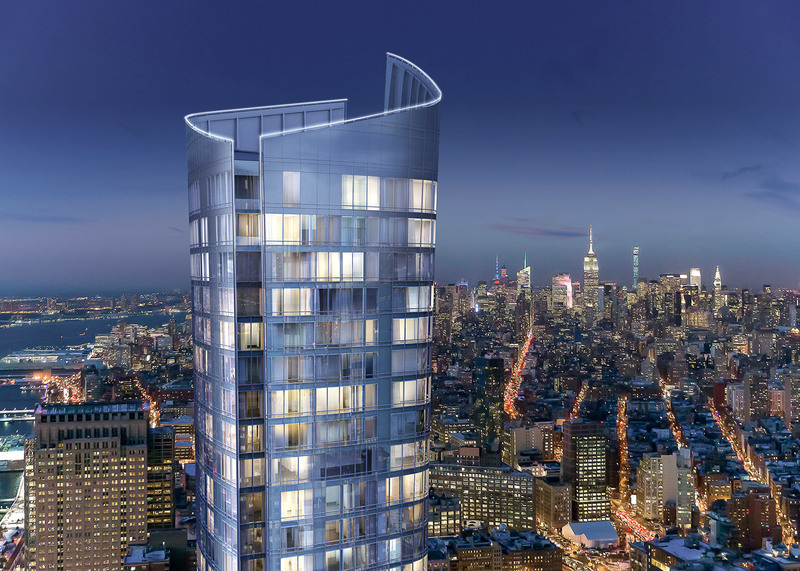 "The sculptural tower gently expands as it moves upwards, culminating in a graceful, distinctive crown," said the project team. "The crystalline facade is visually striking from both outside and inside the building, offering uninterrupted views of the city and its surrounding rivers in every direction." The entrance will be defined by a rounded canopy structure, encircled by gardens designed by local landscape architect Edmund Hollander. The gardens are intended to provide residents with "an immediate respite from the bustle of the city". New York-based David Rockwell – whose recent projects include a furniture line for Stellar Works and a holiday lighting installation in Lower Manhattan – is designing the interior public spaces. The lobby will feature a mix of materials, from anodised steel walls and travertine floors to lighting fixtures made of handblown glass. "In Tribeca, authenticity and craftsmanship really matter, and materials tell rich stories," Rockwell said. "Our palette is minimal, but each material is spectacular." 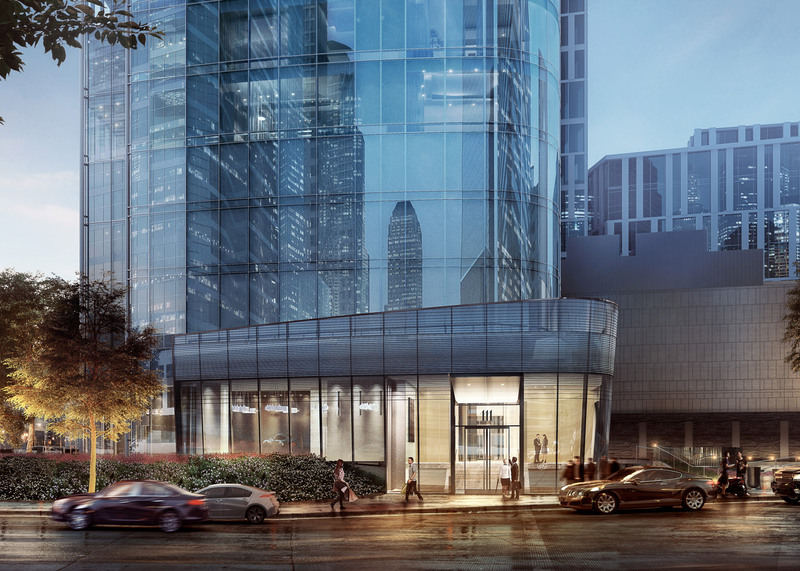 Rockwell has also conceived the amenity spaces, totalling over 20,000 square feet (1,860 square metres). An expansive lounge will feature a 15-foot-high ceiling (4.5 metres), plush seating and an oversized stone and steel fireplace. The space will look toward a reflecting pool and waterfall. A patisserie and a grand private dining room will overlook an enclosed private garden. 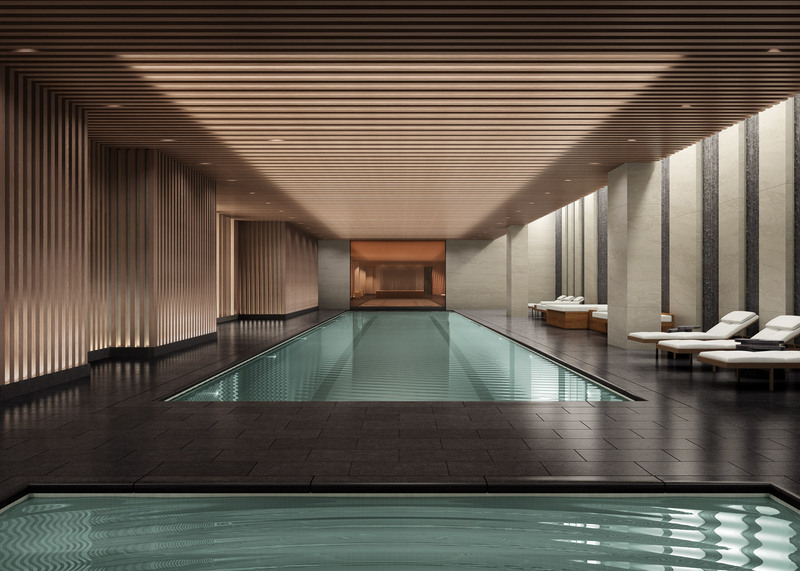 The tower's 75-foot-long (23 metres) lap pool, 25-foot-wide (7.6 metres) splash pool and a hot tub will be housed within rooms finished with teak and stone. 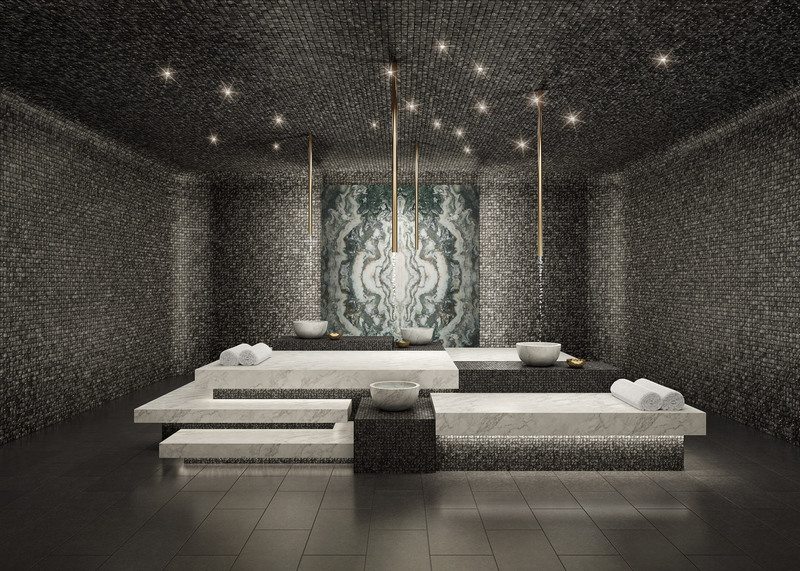 The building's wellness centre will feature a traditional Turkish bath, with heated marble beds and carved sinks. The spa will include treatment rooms, saunas and a hair salon. Encompassing 3,000 square feet (280 square metres), a fitness facility will offer exercise equipment and a yoga studio, separated by a verdant terrarium. "The details of each area inform the whole experience," Rockwell stated. "They give you a sense of underlying care, that these spaces were considered in a meaningful way." Other shared tenant spaces include a children's playroom, a media room and a teen room with arcade games, dart boards, and other recreational offerings. 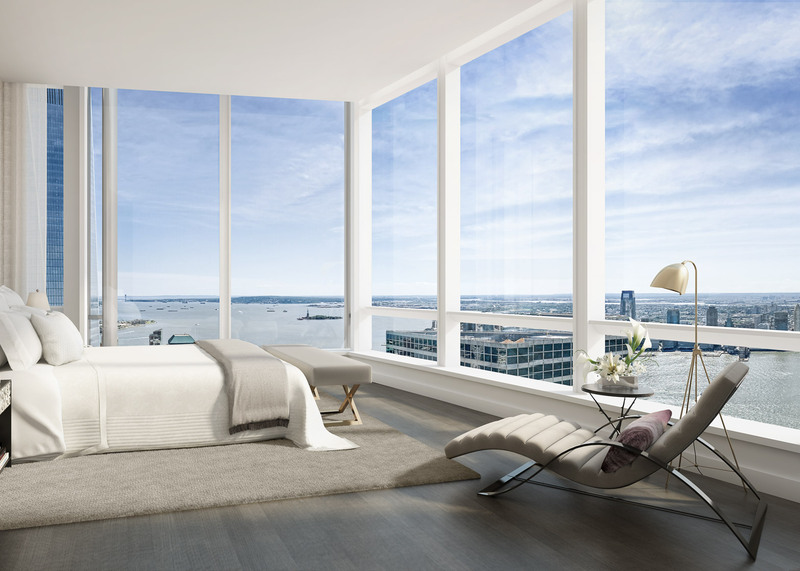 David Mann, who envisioned the interiors for One57 – the supertall Manhattan tower by Christian de Portzamparc – is designing the residences. Intended to be a "study in proportion, light and scale," the units feature full-height glass walls, open living spaces and natural materials, such as oak herringbone floors and stone finishes. The units include European-style kitchens and bathrooms with travertine walls, polished chrome fixtures and free-standing white bathtubs. "It's the final details that make the difference," stated Mann. "We wanted the way you live in these homes to feel effortless, and it's that ease of living that informed every decision we made." The project is backed by the developers Fisher Brothers and Witkoff Group. 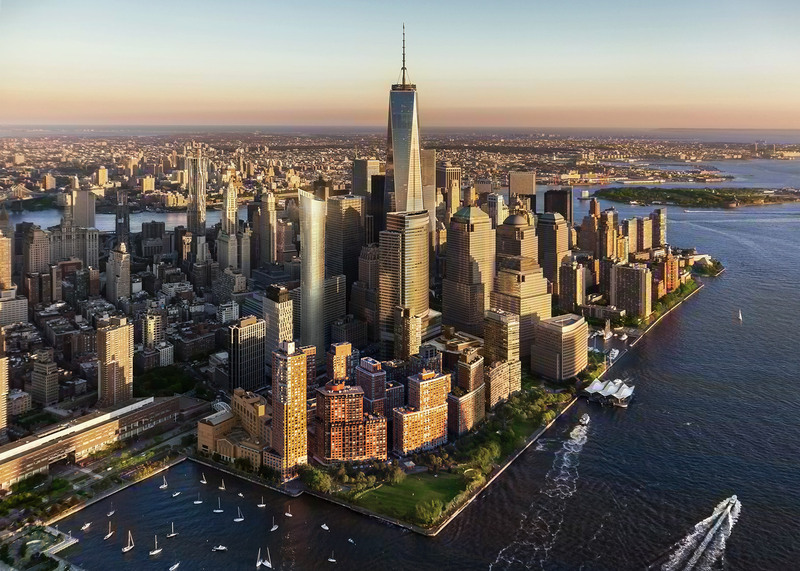 New York is currently experiencing a boom in high-end residential towers, with projects by Foster + Partners, David Chipperfield, Rafael Viñoly, SHoP Architects and many others now underway. In a piece for Dezeen, architect Steven Holl said that "architecture with a sense of social purpose is becoming increasingly rare" in New York. Dezeen columnist Aaron Betsky has also said that Manhattan is being transformed into a Capitalist holy land with no space for the poor. Renderings are by Redundant Pixel Studios.